These lightweight, attractive, reusable kits are the perfect way to ship everything from food to medical supplies. 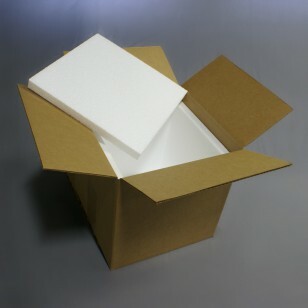 Each kit contains an outer shipping carton and a set of foam liners that act as insulation. The outer carton is a 200# test shipping box that can safely handle up to 65 lbs of contents. The inner liner pieces are 1" thick polystyrene foam that will interlock to keep your product cold during shipping. These kits are reasonably priced and easy to assemble. The perfect solution for customers large and small.